These Must See Places in Europe In Winter Are Our Favourites! Are you looking for the best European cities to visit in the winter months like December or February? You are definitely not alone. Wandering around the best places to visit in Europe in the winter is something we definitely recommend. In our experience, top cities are usually less busy, cheaper, and prime for discovering in the winter. As for our personal experience, we’ve had an amazing time exploring Western Europe in the winter but have also wandered through the Baltics, much of Eastern Europe, and the Nordic countries! While there are warm places in Europe to visit (like parts of Spain, for example) our list focuses on the colder places to enjoy the snow. 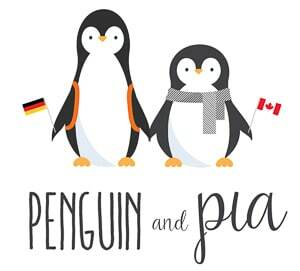 There are plenty of things to do in Europe in the winter – you just need to pack the right gear! 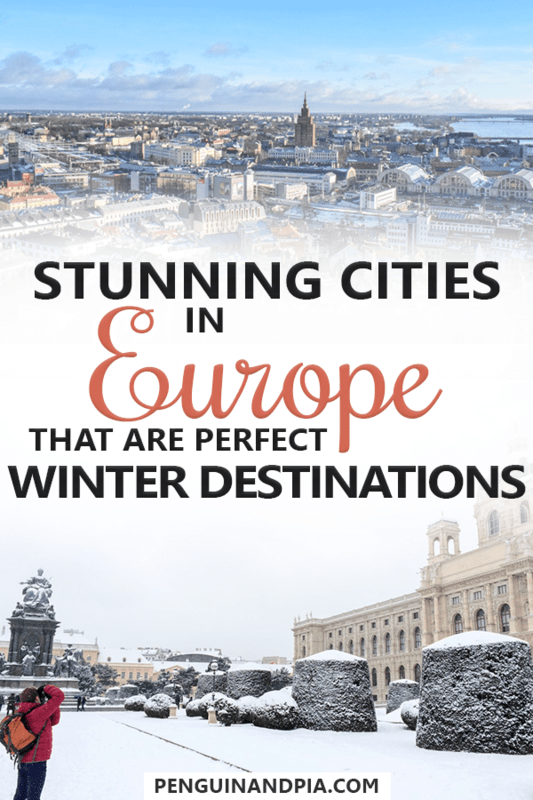 So, whether you are planning a winter Europe itinerary or looking for the best winter city breaks in Europe, these cities should definitely be on your radar. They certainly hold a special place in our hearts! If you want to see more of some of these places, watch the video below. Alternatively, you can also watch it on our YouTube Channel – just click here. 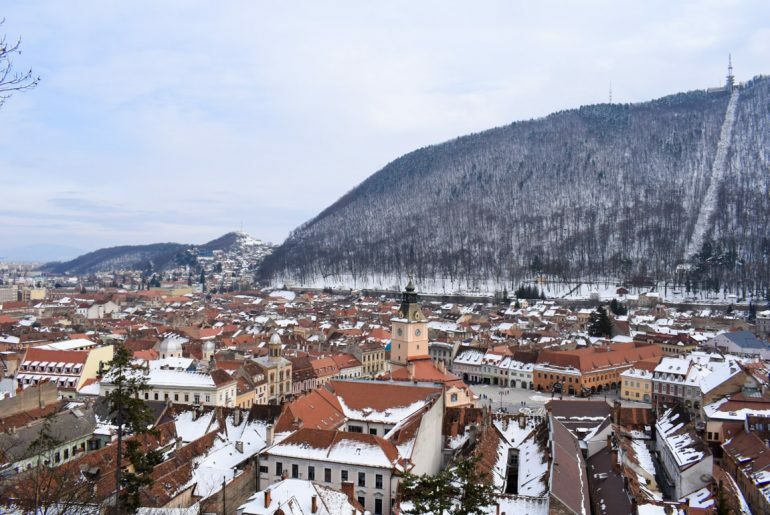 Count on Brasov’s medieval old town to make you never want to leave. Brasov, Romania, will always hold a very special place in our hearts. This is the city that we first stumbled upon during our time on the road in early 2018. The winter weather was in full swing in Brasov, a large city in the famed Transylvanian region. That didn’t stop us from exploring the gorgeous old town of Brasov and going on a few day trips to nearby castles or towns like Sighisoara. One of the things we didn’t end up doing was head to Poiana Brasov, the ski resort that is located to the south outside the centre of Brasov. We know that there is also a ton of winter hiking and other activities in the local hills that we didn’t get a chance to do. This means that we will have to go back to Brasov. As for climate, you can expect it to be snowy and cold so definitely pack for winter weather. It was hard saying “see ya later” from our last train but the snowy ride through the mountains wasn’t too bad, either. Oh, and Brasov is full of great cafes and Eastern European dishes (like goulash soup). These things made the cold more than bearable! Vienna snowfall makes the city pretty magical everywhere you look. Vienna is one of those cities that has stunning architecture everywhere you look. 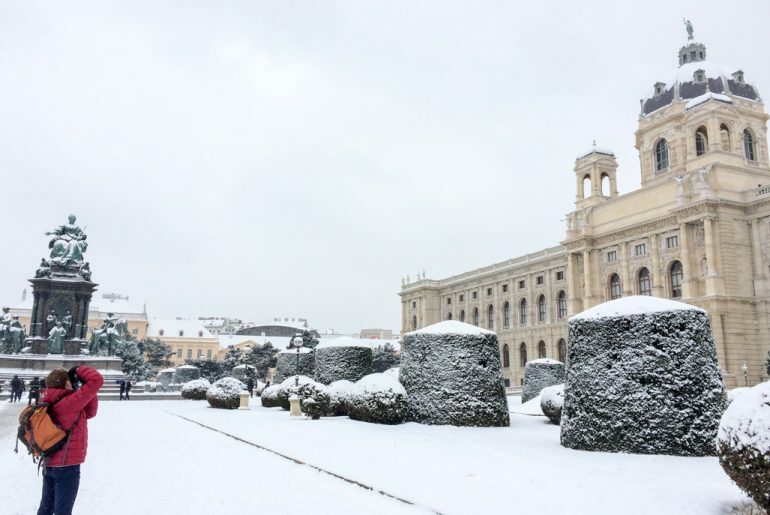 The capital of Austria can also get a ton of snow so it just unashamedly shows its good side when everything has a coating of fresh white powder. We visited in January while on our first winter wander trip and had an amazing time exploring Vienna’s things to do both inside and out. As you can see in the photo, it was cold but not crazy windy in Vienna in January. The snow definitely made good, warm boots an essential item but besides that we were well-prepared for the weather. Eric has also been in the summertime on a summer Europe Trip and honestly both seasons have their unique charm. One isn’t necessarily “better” than the other. Because the city is so large, it can get away with having multiple Christmas markets all over the place. This means that you can travel to Vienna and explore a few different ones – drinking and eating as you go. What could be better than Viennese schnitzel, Strudel, and Glühwein all in your belly at once? Answer: nothing is better. Riga is lovely to explore in the winter months! As the country sandwiched in the middle of the three Baltic States, Latvia’s capital city is the birthplace of the modern Christmas tree (true fact) and features lots to do and see. Eric explored the city without Lisa while heading through the Baltics but enjoyed every moment spent in Riga. The historic city centre had a light snow covering making for awesome photos and an easy wander. He even climbed St. Peter’s Church which was worth the fee for the amazing winter views. Riga is famous for having a few different Christmas markets around the city’s centre areas. One of which is super well-known for the rabbit village that is exactly what it sounds like: tiny wooden houses and real rabbits hopping around this tiny village exhibit! There are also lots of great traditional foods that are sure to fill you up (deep-fried bread) and keep you warm for hours. Besides rabbit villages, the winter months bring with them other amazing opportunities. Eric went on a day trip to Sigulda to the bobsledding track and went actual bobsledding down a track. It was driven by a member of the Latvian sliding team. That’s a memory he’ll have with him forever. Travelling the Baltics? 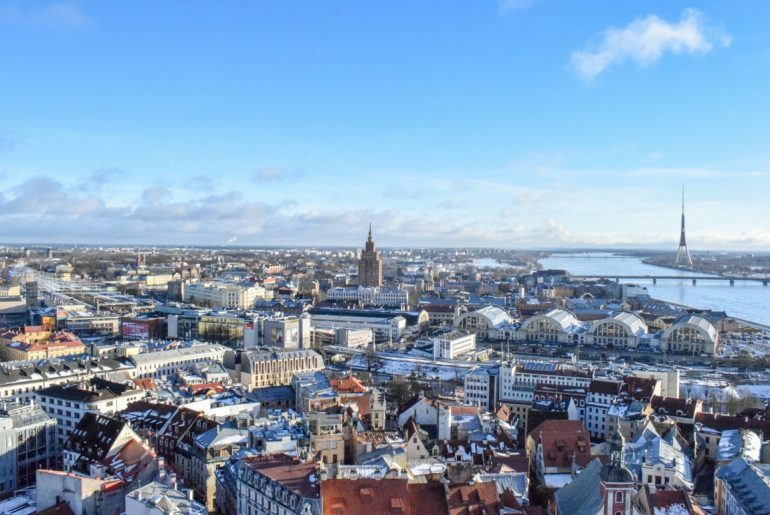 Here’s How to Take the Bus from Vilnius to Riga to Tallinn! The Prague Christmas Markets are always busy and festive. 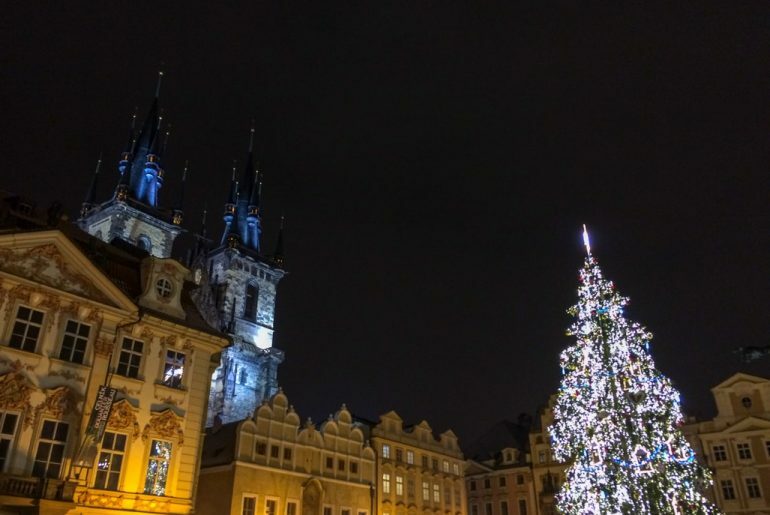 We should start by saying that Prague is a magical city to explore any time of the year – but the winter time is extra special. Something about seeing the Prague Castle or the Monument in Vitkov covered in a layer of snow just adds to the experience. Eric has been in the summer many times and enjoys both seasons for the unique atmosphere they provide to visitors. We visited in early January – basically right after New Years – and the Christmas markets were still in place selling their sweets, trinkets, and hot beverages like mulled wine (Glühwein). There is still plenty to do in Prague if the weather gets too chilly like visiting the numerous indoor museums, exhibits, and attractions all over the city. We mention loads of them in our guide on how to spend one day in Prague! That said, we were prepared for the weather, loved exploring the old town, and ate a warm, delicious Trdelník (chimney cake). The Czech winter can get pretty chilly and definitely snowy. If you want to do lots of exploring, you should have a warm pair of boots, gloves, a scarf, and even a hat. You can always de-layer if you get too warm and stuff your gear into your day pack – or just down a Czech beer… that’ll do the same thing! Our time in Warsaw was actually magical. 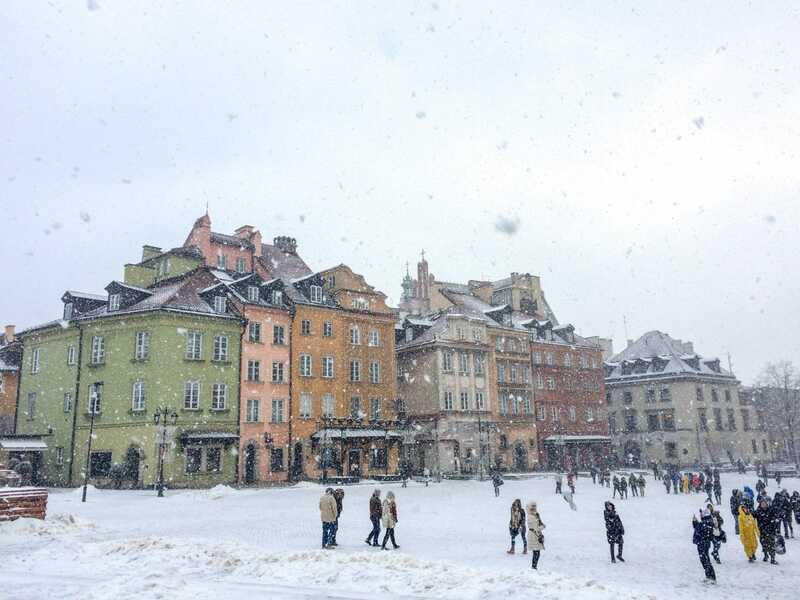 Having just come from Krakow, Warsaw was a city with a different vibe. Considering it’s the capital of Poland, you definitely get more of the “skyscraper” feel compared to Krakow which is more medieval overall. We liked both, but our time in Warsaw was a little extra magical. It was also sad because it was the last city on the first leg of our first trip together ever so we were full of emotions. 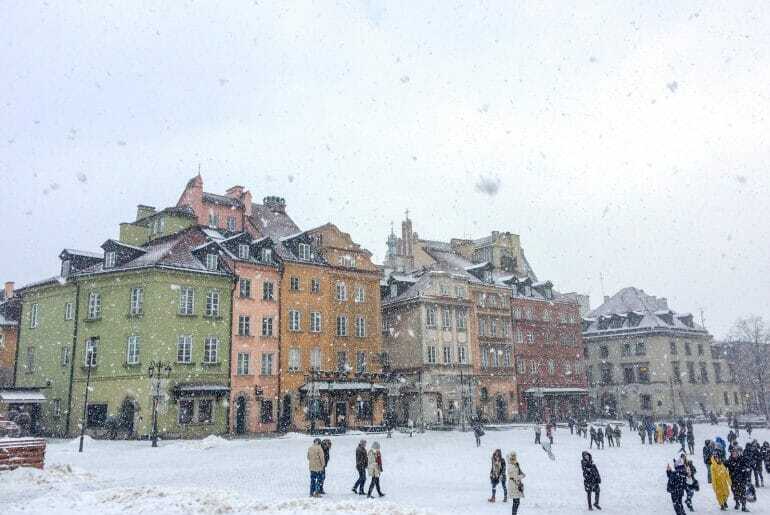 When we visited Warsaw’s old town (located a distance from the city centre), the snow was coming down in heaps so that really added to the experience (see the above photo). We actually had a snowball-throwing target competition which we got on film and have yet to put on our YouTube channel! In any case, we wandered the old town in the snow and had a great time. There was an accordion player in an alleyway and it just made the experience feel super authentic and Central/Eastern European. There are lots of little cafes to grab a hot beverage and there is even a skating rink in the main square where you can rent skates and go for a few laps! Just keep in mind that the Polish winters are known to be frigid and full of snow so prepare for the worst winter weather. Good ol’ Edinburgh – green grass, grey sky. That’s winter. Whenever we write about Edinburgh, it’s always full of a “where do we even begin?” mentality. What a city. If you wandered in off the street, it’s important to note that we first met because of Edinburgh – Eric having lived there and Lisa having done an internship there. 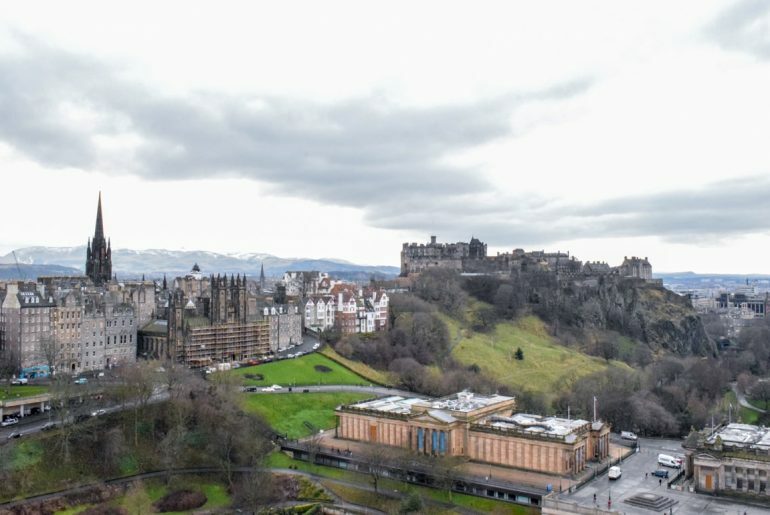 In any case, we have a whole whack of Edinburgh posts to help you plan since we kindaaa know the city well. As for visiting in the winter, some might say to avoid it. We would say otherwise. The spring, summer, and fall are pleasant, sure, but the winter weather beings the rain and the chilly wind. So, why visit? Because the crowds are fundamentally smaller and a little rain never stopped anyone with a good rain coat (like Eric’s Northface ). Edinburgh is built for outdoor adventures so if you’re prepared, you’ll reap the benefits of discovering this beautiful city and actually enjoy it. Another key reason to visit in November/December is because of the world famous Edinburgh Christmas markets. The city goes all out transforming the Princess Street Gardens into a winter wonderland of skating, food, drinks, shops, a Ferris wheel, you name it. They CAN get snow (and did in 2018) but it’s rare that it stays on the ground long enough. Plus, there are plenty of great Edinburgh cafes to warm up at and New Years (called Hogmanay) is a massive celebration in true Scottish style! Würzburg was just thawing out when we visited! 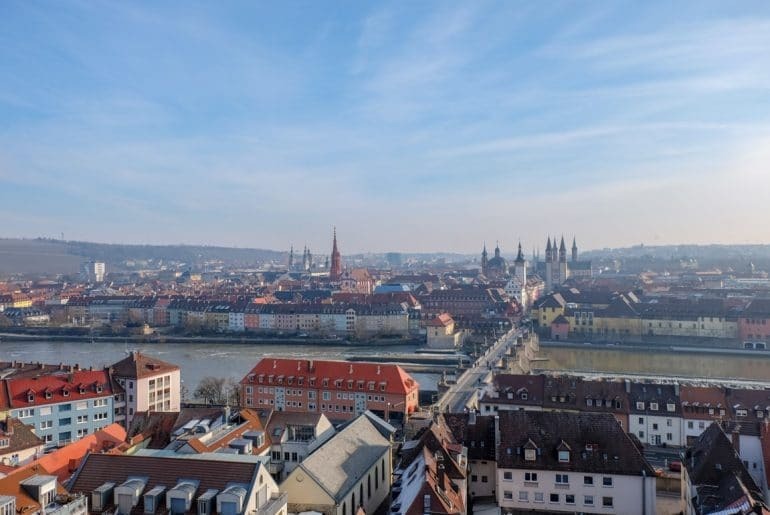 If you want a quintessential small German city, Würzburg is the hidden gem for you. We had a great time exploring the city in early February. The city was just thawing out but there was still ice on the fountains in the park fountains which made of pretty photos. We were obviously too late but Würzburg has a beautiful, old town market square with arguably one of the most beautiful German Christmas markets in the country. Lisa has been there quite a few times and always enjoyed it. The weather in the middle of the winter can get cooler (just below freezing) and the city can get snow – making the cobblestones a little slippery. But it’s nothing a good coat and a nice sturdy shoe can’t handle. The city is made for exploring in any weather. A highlight of Würzburg is hiking up to the massive castle complex (Marienberg Fortress) on top of the hill overlooking the snowy rooftops of the city. Down below, you can see people enjoying a glass of Franconian wine on the Alte Mainbrucke (old main bridge) made from the grapes that surround the famous wine German wine region. Reykjavik is a great city to wander with snow or without. If you’re reading this post and know anything about European travel, you might be aware that Iceland is arguably the most popular destination as of late. Planning a trip to Iceland in any season comes with its considerations, but winter travel definitely makes things a little more tricky. You need to ensure you have the right gear – even if you are just wandering the city. The winter months bring with them colder and unpredictable weather – like in Scotland, you might get all four seasons in a single hour. The capital, Reykjavik can get pretty chilly because of the wind with snow that sticks around for a few weeks. Rain isn’t uncommon if the temperature hovers above freezing. Eric has been to Reykjavik in the summer and the wintertime (February) and even then it was crawling with people. This is mainly due to the winter tourism push to see the northern lights, which is understandable. Those stopover flights to Iceland make it easy to stick around, as well! Reykjavik itself is a great city to wander around. Even with a skiff of snow, the city is very walkable and there’s lots to see and do. If you do want to see some of Iceland’s natural wonders, you can check out the Golden Circle for a hassle-free way to explore the country. Besides, those thermal springs – like the famous Blue Lagoon – are sure to warm you up if you do get too cold! 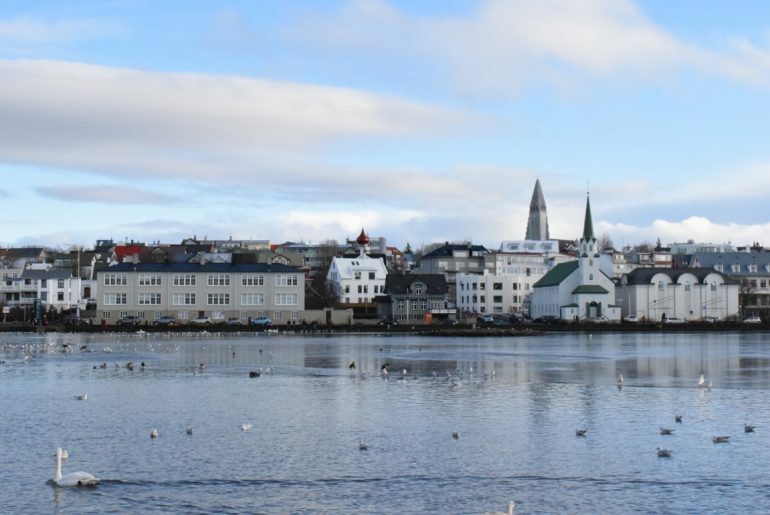 If you need a place to stay, here’s a guide on where to stay in Reykjavik! 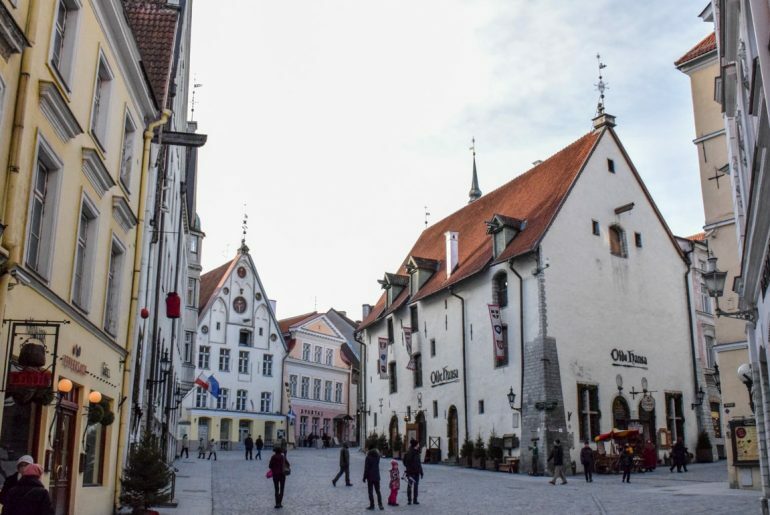 Exploring a frigid Tallinn is a fitting adventure in the winter! Another place that we love for winter travel is Tallinn, the capital of Estonia. Eric wandered Tallinn with a buddy and a local Estonian friend from his time in Edinburgh. While it was great having a local guide to navigate the Tallinn sights, Lisa wasn’t there for this part of the trip so we are dying to get back to explore the city together. Like its other Baltic counterpart in this post (Riga), Tallinn has a beautiful Christmas market set up in the main square. The buildings in the old town make for a medieval wander already but the lights of the small shops and market stalls only add an element of Estonian winter magic to the air. Honestly – go search the photos. It can get pretty in the city with snow that actually sticks around and accumulates. This means that you just need to be bundled up with a good pair of boots to enjoy your outdoor city wandering. Tallinn is also a great city to explore from since a day trip to Helsinki, Finland is just a ferry ride away! Copenhagen doesn’t really get snowy – but the harbour is crisp and colourful. Copenhagen is another European city that has a special place in both of our hearts – more so for Lisa since she lived here for three years! Eric visited for the first time in the winter (February) and had an incredible time soloing the city. We hadn’t met at that time yet! Eric wore his Northface jacket and a thick sweater underneath and was fine in the cool Danish weather. There wasn’t even any snow in the city when he visited. He’s Canadian, though, so he’s a bit of a champion in the cold. Winter in Copenhagen can be a little unpredictable. Lisa remembers many cold and wet winter days. That said, there was also a time a couple of years ago when there was lots of snow. So much snow, in fact, that it was impossible to bike anywhere – and that means a lot when you’re talking about Denmark! The city is awesome for outdoor winter exploring with plenty to see and do in Copenhagen. There are lots of palaces, castles, gardens, and monuments that you can climb and explore in the colder weather. Eric even did the classic flat boat harbour cruise in February and it wasn’t THAT cold. If you do get cold, pop into one of the many coffee shops for a hot drink or an indoor food market for a bite to eat. 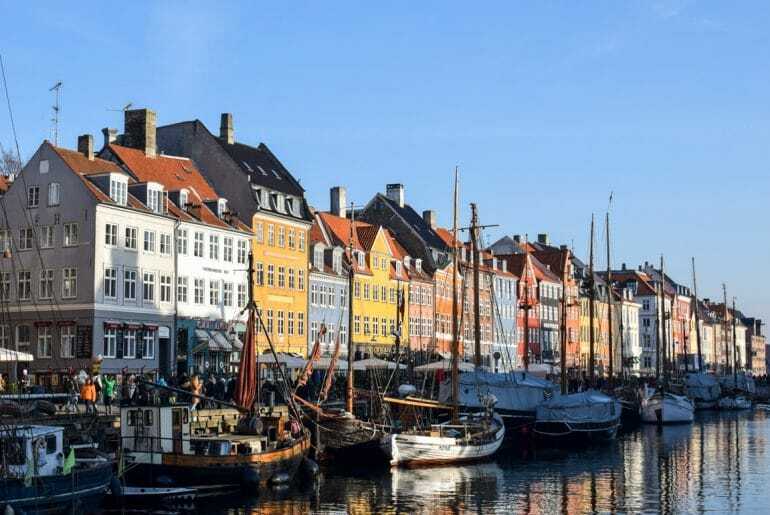 We list some in our guide on how to spend one day in Copenhagen! Just to prove that Oslo is colder, windy, but still beautiful in the winter! Oslo is a super special place to visit in the winter time. For starters, the crowds are greatly reduced – meaning you have room to breathe as you wanted to Norwegian capital city. The Norwegians are known for their love of the winter time and all the activities it has to offer. Just look at their performance in every single damn Winter Olympics! As such, you can check out the ski jumping park north of the city and the numerous cross-country skiing trails close by. 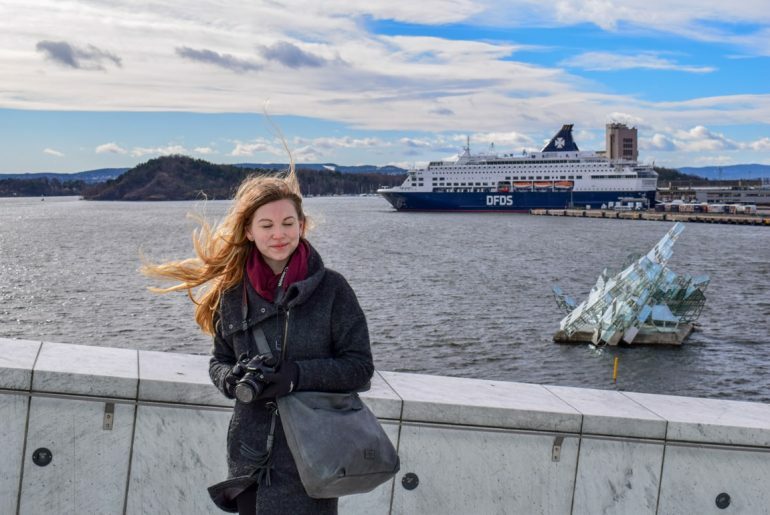 We visited Oslo in 2017 and while it wasn’t the absolute middle of the wintertime, it was still chilly enough to need gloves. Oslo is great because – since they embrace the winter – many of the popular open-air museums in the city remain open in the colder months. The famous sea pool – Sørenga – transforms from its summer identity to a place for a polar dip! Oh, and north of Oslo there is a free toboggan track that is TWO KILOMETRES long through the hills and you have to ride public transportation (metro) to get back to the top again. Yeah, seriously. You can read more about this and other amazing things to do in Oslo here! If you need a place to stay in Oslo, we also wrote about the best Oslo neighbourhoods and accommodations. Lisa always thought the “tree” was.. a good attempt at being festive! If you’re looking for a different winter experience and want to escape the cold for a bit, then how about a trip to the south of Spain? There are lots of attractions in Spain and the south of the country offers some really nice things to do. While Málaga is actually not one of Lisa’s favourite Spanish cities, it was quite cool to see it with all the Christmas decorations. Lisa and one of her friends flew from Bilbao (where they both studied abroad) to Málaga in the middle of December and spent a few nice days in the city. Don’t expect any snow – the temperature was a nice 15 degrees Celsius on average. Lisa actually got slightly sunburned, believe it or not. On the other hand, don’t expect it to be warm enough to go swimming either. The temperatures were perfect to spend time outside and explore the city on foot. Málaga is also known for its Christmas lights, which are certainly not everyone’s style (Lisa was admittedly a bit shocked when she first saw some of them) but still very cool to see. 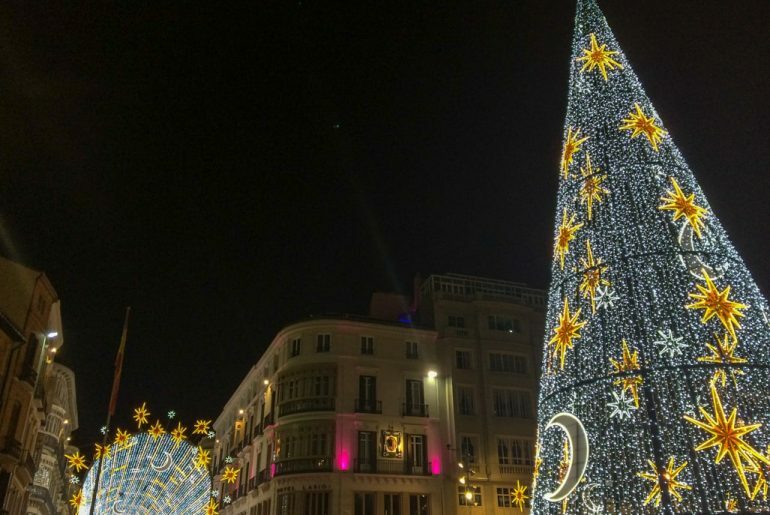 There are also lots of Christmas markets happening in and around Málaga so you don’t have to trade the Christmas markets for the nicer weather. The city is also a great endpoint of any Spanish trip itinerary you might be on. In fact, you might even start in Málaga and head north! And there you have it, 12 of our favourite places in Europe for a winter wander. Obviously, there are a few places we’ve been to that we left off and a ton of places that we have never been to in the winter. This just means that we have a bunch more travelling to do! What do you think of our list? Have you been to any of these spots? Get in touch and let us know – we’d love to share stories!